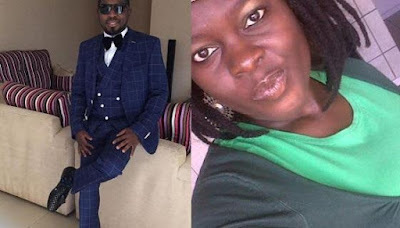 The murder case of Mrs Yewande Oyediran, the woman who allegedly stabbed her husband, 38 year old Oyediran Ajanaku to death at their Akobo estate home in Ibadan, Oyo state on February 2nd 2016 after a domestic dispute (Read here), came up for hearing yesterday June 5th. During her cross examination, Yewande denied killing her husband, claiming she loved him. Led in evidence by her lead Counsel, Leye Adepoju, Yewande narrated how her late husband met his untimely death on the day of the incident. "We earlier had a scuffle in which my late husband beat me up and it was settled by our landlord and his wife and my husband had gone for treatment in a neighbourhood hospital, after I had inflicted some cuts on him, because he had pressed me on the bed and continually hit me. This was the aftermath of a phone call I received from a woman on that night who had earlier claimed that she had a child for my husband. My husband confirmed it and we have quarreled over it, but had settled the issue since she first called me on July 7, 2015. However, after some few hours, he became angry again and started hitting me with a plank. He was angry about the wounds and threatened to retaliate. I managed to escape and he still followed me outside with a knife and pressed me to our Landlord’s car. Later, I felt that I have been able to push him off me, only to later realise that it was actually our landlord that had helped me out of his grips. I rushed to our landlord’s flat and once inside, i turned to see what was going on behind me, only to see my husband coming after me. Suddenly, I saw him falling on his back as he tried to climb the steps to the apartment. I rushed back after him and tried to pull him up only to see blood gushing out of his neck. I quickly shouted for help and the landlord and his wife together with his son and a Doctor whose clinic was on our street, tried to apply first aid. My landlady told my Landlord to take my husband to the hospital, but he declined saying that there was blood on his car and so needed to wash it before he can take it out. "My landlord and I went to our neighbour, Mrs Olubunmi Onipede, to help me take him to the hospital, but she refused too, saying that I earlier insulted her when she came to intervene in the earlier scuffle. Eventually, she agreed to take us to the hospital later I have promised to fuel her car the next day, because she had told us she didn’t have fuel in her car. While on our way to the University Teaching Hospital, UCH, as advised by the Doctor inside our compound, our neighbour, stopped at the hospital on our street claiming that we needed to collect a referral, but the Nurse on duty, said we didn’t need one and I also heard the voice of the Doctor in the back ground telling her we didn’t need one, but that we should rush to UCH. We proceeded towards the hospital only for her to take Akobo Road, when we got to General Gas Road, instead of the Iwo Road that is shorter, I asked why she was taking the route, but she replied that we must take him to the nearest hospital because it was an emergence case. At that time, I still kept calling my husband, ”lowo”, ”lowo” and he was nodding to me even though his eyes were closed". "I did not kill my husband. I love my husband, even if we quarrel, it won’t be to the point of death”. The presiding judge and Chief Judge of Oyo state, Justice Munta Abimbola, afterwards adjourned the case till July 10 for adoption of the written addresses of both the prosecutor and the defence counsel.